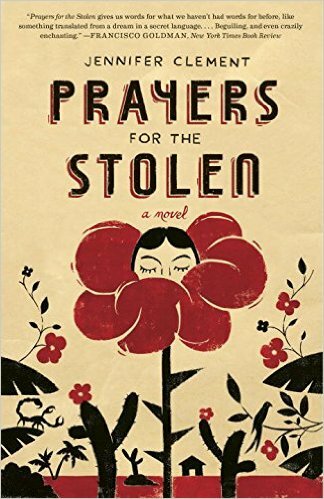 "Now we make you ugly, my mother said" – runs the first sentence of Prayers for the Stolen, Jennifer Clement's mesmerizing novel. For the young protagonist, Ladydi Garcia Martínez – her very name a battlefield, showing her mother's contempt for men –, these words and the act that follows constitute her first memory in life. Her mother does to her 5-year-old daughter what all mothers do in that part of rural Mexico: she disfigures her by blackening the face and teeth with charcoal, because the only chance to escape the danger inherent to being born a girl – a girl who could be abducted by drug traffickers at any time – is to pretend as long as possible that the girl is, in fact, a boy, and make her ugly after that. Ladydi's best friend Maria, born with a harelip, is considered fortunate because her appearance keeps her safe. From the onset, the book's most pervasive metaphor is the human body itself. The solitary existence of mothers and children in the mountains of Guerrero, where husbands leave their families to seek job opportunities elsewhere, and never return, is likened to missing a limb: "On our mountain, there were no men. (….) It is like being a person with one arm, my mother said". The transformation of the body is a significant concept throughout; apparent not only in the feigned disfigurement of the daughters' bodies ("She held an old cracked mirror to my face", Ladydi tells. "The crack made my face look as if it had been broken into two pieces"), but also in the way these hardened, betrayed mothers hope for their own transformation in the local beauty parlor. When Ruth, the owner of the beauty salon disappears, the text connects beauty and death in a harrowing way: it was impossible to tell if "those bright red spots on the floor were blood or drops of red nail polish". The closeness of the girls is also expressed in bodily images. In one of the most disturbing episodes – condensing the many ways these young girls can be harmed and violated –, Paula, the most beautiful of them all, is caught up in one of the herbicide showers the authorities deploy from helicopters to destroy the drug lords' poppy fields, and while her schoolmates desperately try to wash the poison off her body, they are seen by their young teacher. "That night Estefani, Maria, Paula, and I menstruated for the first time. My mother said it was the full moon. Estefani's mother said it was because of the poison triggering something bad inside of us. But we knew what had really happened. José Rosa had seen Paula naked. (…) He saw her young, teenage beauty. At that moment, we became one woman and it was as if he'd seen us all." It will be Paula, naked and vulnerable in her bath towel after shower, who gets to be stolen by drug traffickers, while Ladydi hides in a hole in the ground. Later on, Ladydi learns that for the stolen girls, the body serves as a means of communication: through self-inflicted cigarette burns, they use it as a sign to show they had been kidnapped. Ladydi grows to be fiercely loyal, resourceful, smart, yet naïve and aching for connection, never really understanding how her father could have left her. Finishing school, she moves to the city for work, hoping to escape the usual pitfalls awaiting her contemporaries. As her mother puts it: "You're not going to sell iguanas on the side of the road. You're not going to go to the beauty parlor school in Acapulco. You're not going to be a maid in Mexico City. You're not going to work in a factory in the border. You're not going to stay here doing nothing and you better no get pregnant or I'll kill you". The book is divided into three parts: the first depicts the thwarted Paradise of childhood in the mountain village, among iguanas, ants, and blond, transparent scorpions: a place sensuous and possibly lethal. Life in the marble house in Acapulco – where Ladydi moves in as a would-be-nanny – resembles a limbo-like state, with Ladydi, the housekeeper and the gardener constantly waiting for the masters who never return. The dreamlike quality of this part is further enhanced through the recurring image of drowning. The third part is set in the Santa Maria Jail, the "biggest beauty parlor in the world", which shows yet another close-knit community of women without men. Here we get a haunting summary of the many ways the lives of women can get derailed in Mexico. Aurora, one of the inhabitants, a former stolen girl, is a bridge between this world and that of the mountain village, and a key to Paula's secret. This is a highly poetic, yet unpretentious book, where sentences invite the reader to re-read them and soak them up, even if they break the heart. The consciously deployed images – whether of poppy fields, mirrors, or the flip-flops of the girls – create strong connections in the text, making it one breathing, resonating body. The narration frequently relies on flashbacks, especially when it attempts to tell and retell major traumas – whether it is being abandoned by the father, or Paula's abduction. Despite the heart-wrenching subject matter, the tone remains bright and matter-of-fact, sometimes even playful, showing an unquenchable belief in solidarity and compassion.